Welcome back for the third installment of WHO’S WHO WEEK here at FIRESTORM FAN! Today we’ll be looking at Who’s Who in the DC Universe #10 (June 1991). This was the fourth Who’s Who mini-series and was published in a loose leaf format (you can see the hole punches in the images below). This was an interesting volume of Who’s Who because they weren’t tied down to the alphabetical format. Since it was loose leaf, they could cover whatever characters they wanted each month. It certainly made for more timely entries and the binders were fun. Each issue included 24 character write-ups and sometimes a bonus fold-out poster or map (of places like the Batcave). 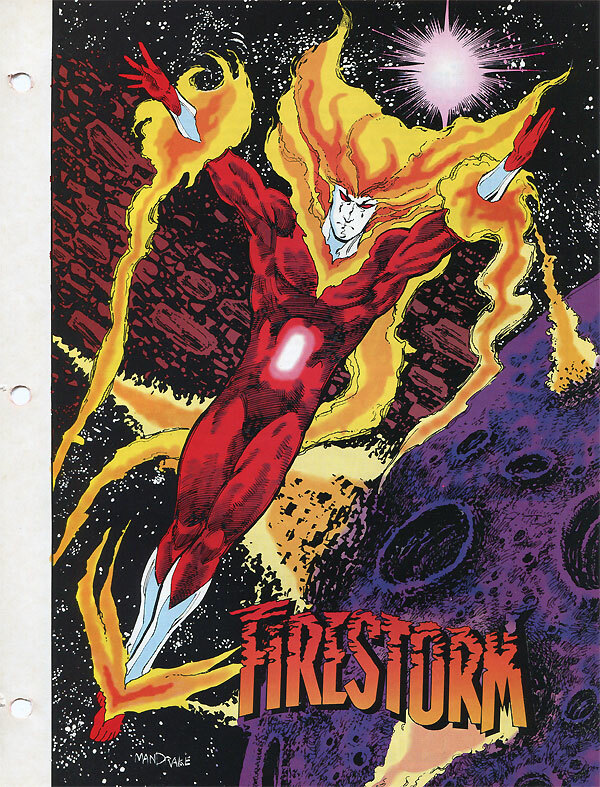 The particular entry we’ll be looking at today is the second Elemental Firestorm (Martin Stein). The text was written by John Ostrander with art by Tom Mandrake. Look at that gorgeous image of the elemental Firestorm! I love that hair! Tom Mandrake did such a great job on this series. The coloring below is a bit odd on the stomach, but it doesn’t detract too much from the line work. When this Who’s Who was published, Ostrander and Mandrake had just finished up the Firestorm monthly series about 10 months prior. It was nice that DC included Firestorm in this volume of Who’s Who, especially since he didn’t have a monthly book at the time and wasn’t really active in the DC universe. In addition to being loose leaf, this format was a little different than previous Who’s Who formats. First, it was oversized. Each page was about the size of a sheet of notebook paper (larger than a standard comic page). This was nice because it helped showcase the phenomenal art for each character. Second, each character had the front and back of a sheet of paper. So below you’ll see the front-side picture of Firestorm and the following image will be the write-up on the back-side. If you are interested in reading the text, click that image for a larger version. In the late 1980s and early 1990s, Mayfair Games published a role-playing game set in the DC universe called DC Heroes. From everything I’ve read the game was well-received, however, don’t ask me as I’m biased. I played the game for years with friends so I think it was fantastic! In an effort to capitalize on the popularity of DC’s Who’s Who, Mayfair published role-playing supplements in 1992 and 1993 that served as companion pieces to DC’s Who’s Who in the DC Universe. 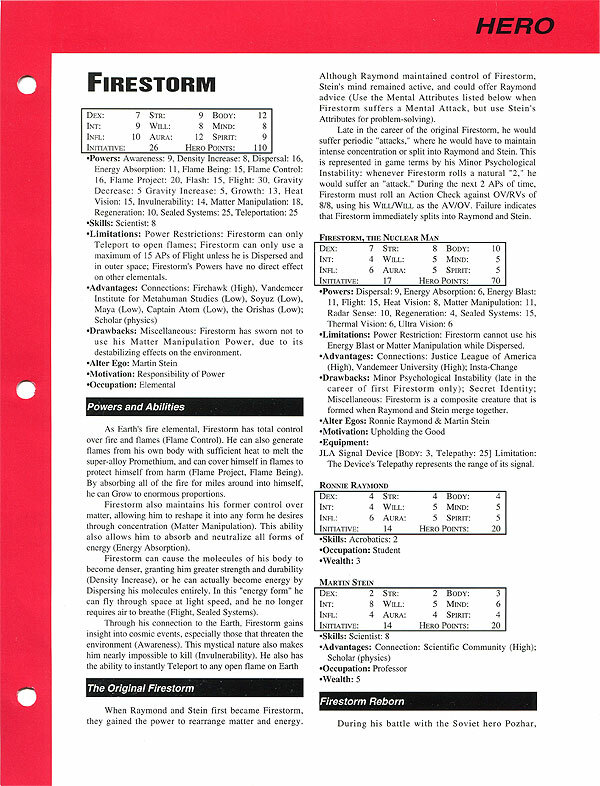 Mayfair’s supplements featured role-playing statistics for each character, tips to role-playing the character (such as personality and subplots), and a complete list of comic book appearances for the character. Mayfair’s Who’s Who supplements were laid out in the same loose leaf format and used similar design elements, such as the colored borders and topic headers. While they didn’t look exactly like DC’s Who’s Who pages (Mayfair’s pages were slightly bigger and they used a different font), they were pretty darn close. This made it very easy for fans to insert the Mayfair Who’s Who pages into their binders right next to their DC Who’s Who pages. 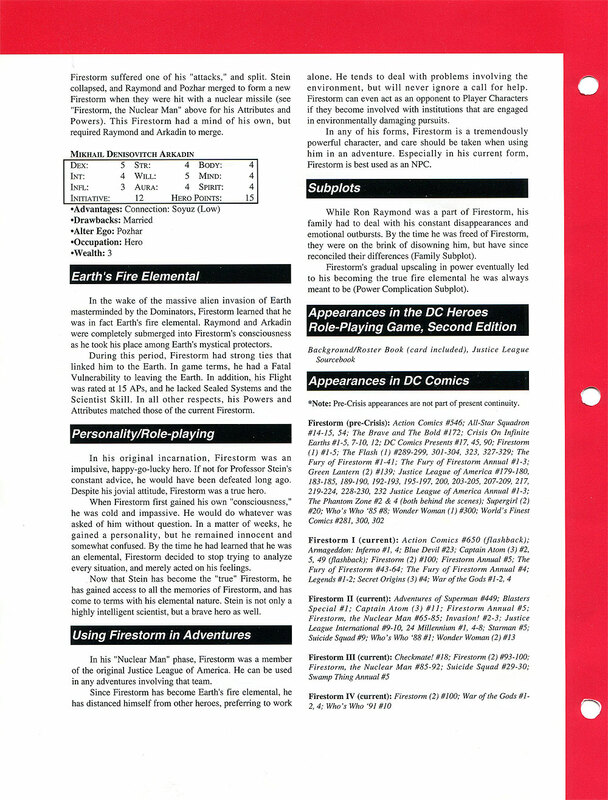 So you could have the DC artwork and character history right next to your role-playing stats. Pretty cool for role-players like myself. Mayfair published three volumes of their Who’s Who supplements, with each volume covering the same characters that were covered in four issues of DC’s Who’s Who. For example, the first volume of Mayfair’s Who Who’s supplement featured the exact same characters that were presented in issues #1-4 of DC’s Who’s Who in the DC Universe. 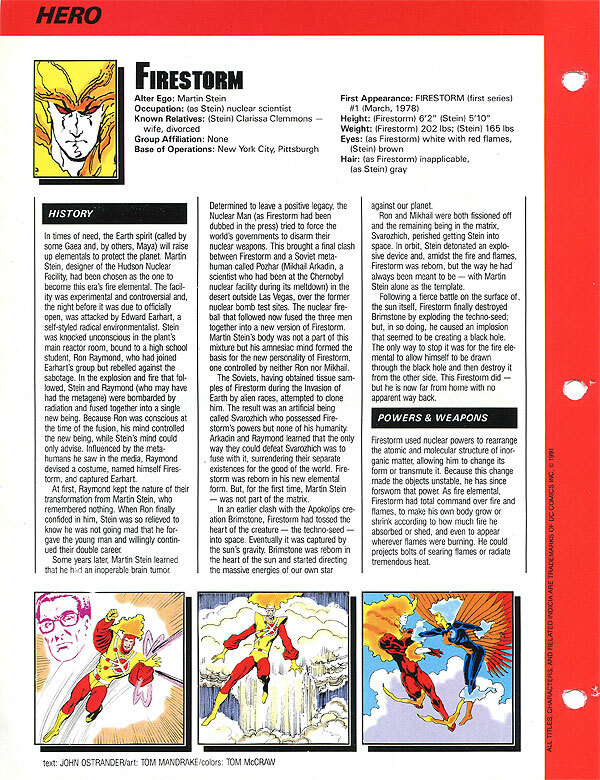 Since Firestorm appeared in #10 of DC’s Who’s Who in the DC Universe, he was featured in the third (and final) volume of Mayfair’s Who’s Who supplement. Below you will find the front-side and back-side of the Mayfair Who’s Who Firestorm entry. I realize the role-playing statistics may be meaningless to you, but I still think this piece of Firestorm memorabilia is worth posting. If you are interested in reading the text, click the image for a larger version. Come back tomorrow when we talk about Ronnie Raymond flying solo! Posted in: Comic books, Firestorm #04: Elemental II (Martin), John Ostrander, RPGs, Tom Mandrake, Who's Who. That little white slot in his stomach is where he keeps his lunch. What was the whole deal with this elemental thing? My memory is that Swamp Thing was Earth and Aquaman was Water, but…Air? Is that all stuff that happened or just stuff I remember people speculating about at the comic shop? Ravenface – Thanks for the comment. You’re close. Then after Firestorm left for space, there was a new Fire elemental that appeared in the pages of Aquaman named Corona. I still consider Mayfair’s move to tailor its Who’s Who products around the mainstream Who’s Who to be one of the coolest uses of licensed material. It would be like the Star Wars RPG giving detailed rules for how to use LEGO Star Wars material in the game. I like this particular ‘Whos Who’ loose leaf. Lots of cool info. That list of appearances in the DCU was handy. I dident know he appeared in some of those issues. Ive never did get into role-playing games…but it looks fun!